The wire mesh partitions we manufactured are generally divided into three kinds, standard wire mesh partitions, heavy duty wire mesh partitions and transit connect partitions. Using wire mesh panels and posts forms wire mesh partition walls, then put the partition walls into warehouses or factories, letting the two ends of the partition to be fixed to the walls by wall clip kits, then the place would be cut into several parts as you required. Wire mesh partition walls could cut the houses into different parts for different storage applications. Our wire mesh panels can also form independent areas with posts, corner posts and sliding gates or hinged doors, sometimes the roof panels are also needed. Those kind of independent areas are not only used for storage, but also can be used as office areas. 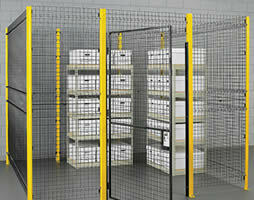 Wire mesh panels together with posts and corner posts would form an independent area for storage or office use. Wire mesh partitions can also be used to isolate machines or other equipment. Sometimes the machines are dangerous, and people should get away from those machines. In a limited place, isolate the dangerous machine from people by wire mesh partitions is you ideal choice. And sometimes the machines are precious and precise, people's touch might influence their operation. Under such condition, wire mesh partitions are necessary. 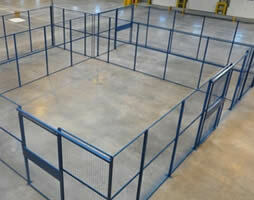 Wire mesh partitions can isolate machines from people so as to protect both machines and people. The various combinations of wire mesh panels, posts, corner posts, service windows and hinged doors or sliding gates would ensure the combined wire mesh partitions perfectly fit the size of rooms. And our wire mesh panels can be expanded or dismounted according to your needs. First, the steel frames have high tensile strength, especially the heavy duty wire mesh partitions, their whole structures are reinforced by C-shaped steel channels which are very hard to cut off. So when the door is shut, it is very difficult to get in. Second, our wire mesh partitions provide high visibility, and the wire mesh structures allow the flow of water. So the fire can be easily found and then put out by water. As you can see, our wire mesh partitions could satisfy all your needs and requests, and you are sure to find what you really want in our company. Do not hesitate any more. If you have any queries, please do not hesitate to email us directly at pati@wiremesh-partitions.com. We are looking forward to answering your questions. Wire mesh partitions formed by wire mesh panels, strong frames and posts have high rigidity for tool house and warehouse applications. Heavy duty wire mesh partitions have more reinforcement to the frames, so as to ensure certain safety factor for important equipment or other machines. 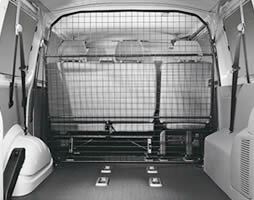 Wire mesh partitions for transit connect are widely installed in many cars to separate the drivers from the pets in the boot, so as to protect them. Copyright © 2015 PATI Wire Mesh Partition Company Add: No. 289 Zhongxing road, Anping County, Hengshui City, Hebei Province, China.